It’s getting to that time of year when, if I wake up early at the weekend, it’s a bit too dark to read my print book. So the other weekend, I picked up my Kindle and thought I’d read a few chapters of this book until it got lighter. Suffice to say, a few hours later I was still happily reading. It is indeed, as it says on the cover, a really feel-good book. And you will be singing the S Club 7 song in your head – you can’t help it and let’s face it it’s a bit of a feel-good song too! Evelyn’s life had been going to plan: childhood sweetheart husband, great house even if needed a fair bit work, steady job as a teacher in her local school. But sometimes life doesn’t stick with the plan and Evelyn finds herself separated and wondering what to do with herself. Her sister Tara invites her to move to Dublin and stay with her for a bit. So Evelyn leaves behind her job, her soon to be ex-husband, her failed marriage and her home to see what Dublin has to offer. Unable to find work as a teacher, through a chance encounter she gets some work in a run-down traditional Irish pub. With the help of Danny, a local busker, she has grand ideas to revamp the pub. Should she reach for the stars, as her late father always advised, and take the risk or head back to her old life back home in Ballybeg? From the very start I was mentally cheering Evelyn on and also young Ruby, the troubled teen she tries to help. Evelyn was determined to make a success of her life in Dublin and though things didn’t work out exactly as she’d hoped, that determination saw her taking chances even though the opportunities she had were very different from what she had thought her life might be. And then there was the very lovely busker Danny of course, gorgeous and talented but with troubles of his own. These two could be just what the other needed but would either be willing to take that kind of chance? The new opportunities open to Evelyn weren’t without their challenges though making this a convincing story. There were plenty of likeable characters providing laughter and some tears throughout the book including Colm, Christy and Ruby and a small but significant part is played by homeless man Martin. The author had a really enjoyable style of writing which meant I flew through the pages, eager to see what opportunities would open up for Evelyn and whether taking chances would pay off for her or not. I’ve heard that a new phrase has been coined recently for uplifting novels – ‘up-lit’ – and I would say this books certainly fits in that category. It was such great fun to read and reminds us that even if life doesn’t follow the path we hope, there are often second chances and unexpected opportunities if we reach for the stars. Definitely a book to reach for when you want a satisfying feel-good story. My thanks to Kim at Bookouture for my review copy of this book via Netgalley. 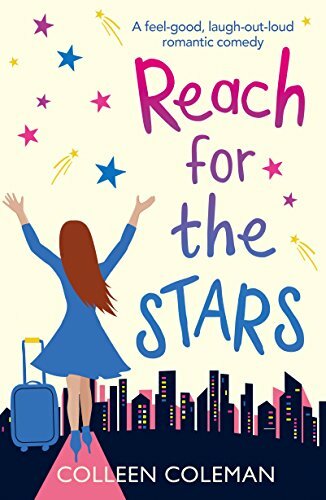 Reach for the Stars was published on 21st September and you can order a copy online here: Reach for the Stars At the time of writing it’s only £1.99 so go on, treat yourself! When Evelyn Dooley married her high-school sweetheart, James, she thought she was set for life. Now she’s 28, single, and fleeing to Dublin from her small hometown to avoid the gossip surrounding their break-up.